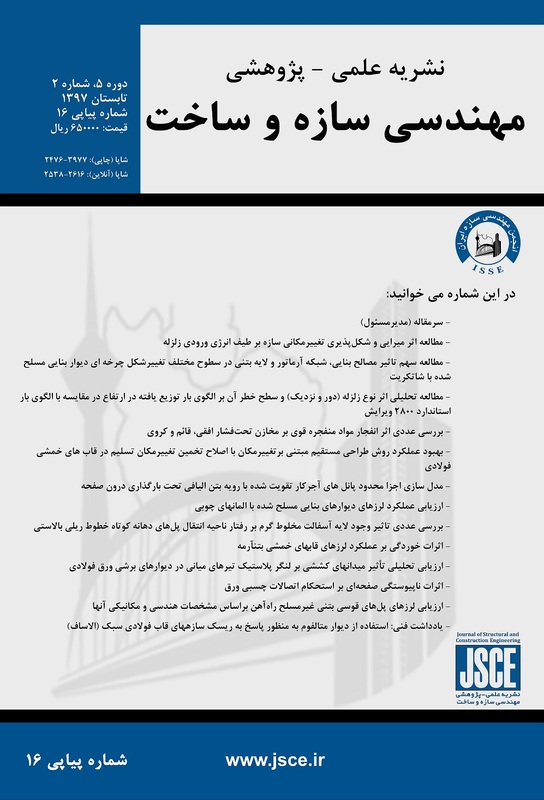 سیستم قاب سبک فولادی راکه به اختصار LSF (ال اس اف) می نامند، یک سیستم ساختمانی است، که برای اجرای ساختمان های عمدتاً کوتاه مرتبه و میان مرتبه (حداکثر تا ۵ طبقه) استفاده می شود. اگرچه این سیستم از مزایای قابل توجهی برخوردار می باشد، اما در کشور ما با استقبال زیادی مواجه نشده است. به همین سبب در این پژوهش سازه های ال اس اف را از مرحله ی طراحی، اجرا تا بهره برداری بررسی می گردد و ریسک های آن ها را به طور دقیق شناسایی و توسط روشی که بر پایه ی تکنیک FMEA و تئوری فازی می‌باشد، ارزیابی می شود و ایده ی جدیدی برای اجرای سازه های ال اس اف بیان خواهد گردید که ضمن بهینه سازی زمان، هزینه و کیفیت، می تواند پاسخ دیگری به تعداد زیادی از ریسک های شناسایی شده باشد. این ایده، سیستم دیوارهای متال‌فوم نام دارد که جزو سیستم های مورد تأیید مرکز تحقیقات، راه، مسکن و شهرسازی می باشد. در این پژوهش پس از معرفی این سیستم، به بررسی ترکیب این سیستم و سازه های ال اس اف پرداخته می شود و نتایج آن از نظر هزینه، زمان اجرا، وزن سازه و شرایط اجرایی تشریح می گردد. هم چنین نتایج مقایسه‌ی بین هزینه، زمان اجرا و وزن سازه توسط تحلیل سلسله مراتبی مورد ارزیابی قرار می‌گیرد. نتایج این مقایسه امتیاز 54 را برای ترکیب سیستم متال فوم و ال اس اف درمقابل امتیاز 46 نسبت به سیستم معمول اجرایی سازه های ال اس اف نشان داد. Light Steel Frame System that is briefly called LSF is a building system which is used for implying of short-rise and mid-rise buildings (up to five floors). This system gets significant benefits, although in our country it is not much used. So in this article, are tryed to study LSF structures from the design and implementation stage to the operation one and identify its risks exactly and evaluate them with combination technique which used failure modes and effects analysis technique‌ (FMEA) and fuzzy method.Then express new idea for implementation of LSF structures that optimizes time, cost and quality and can be respond of many Identified risks.This idea named Metalfom Walls that included in systems verificated BHRC. In this article are explained this system first, then combination of Metalfom and LSF system are discussioned. The result of this combonation in aspect of cost, time ,weight of structure and conditions of implementation are explained. Comparison of results in aspect of cost, time and weight of structure by Analytic hierarchy process technique (AHP) are evaluated. Results of this evaluation show that combination of Metalfom system and Light Steel Frame System (LSF) earns 54 score and LSF system that implementated in common way earns 46 score. معاونت برنامه ریزی و نظارت راهبردی رئیس جمهور. (1391). آییننامهطراحیواجرایسازه­های فولادیسردنورد(بخشسازه). نشریه شماره612. Annamária DUDÁS. (2003). LIGHT STEEL STRUCTURES IN RESIDENTIAL HOUSE CONSTRUCTION. PERIODICA POLYTECHNICA SER, V 47, NO. 1, PP( 133–136). Fallah,M,H. (2005 ). SUSTAINABLE BUILDING CONSTRUCTION. World Sustainable Building Conference, Tokyo, Pages(2645-2652). Trevathan, J,W. Pearse, J.R. (2008). The effect of workmanship on the transmission of airborne sound through light framed walls. Applied Acoustics, V 69, Pages(127–131). Murtinho,V. Ferreira, H.( 2010). Architectural concept for multi-storey apartment building with light steel framing. Steel construction, V3, pages(163-168). Mahdavinejad, M. Hajian, M. Doroodgar A. (2011). Role of LSF technology in economic housing for urban Sustainability; case of Iran. Procedia Engineering. Vol 21, Pages(2-7). Mahdavinejad, M. Hajian, M. Doroodgar A. (2012). Modeling of LSF Technology in Building Design & Construction Case-study: Parand Residential Complex Iran. Advanced Materials Research, Volumes 341-342, pages(447-451). Ariyanayagam, A, D. Mahendran, M. (2014). Numerical modeling of load bearing light gauge steel frame wall systems exposed to realistic design fires. Thin-Walled Structures, V78, pages(148-170). de Angelis, E. Serra, E. (2014). Light steel-frame walls: thermal insulation performances and thermal bridges. Energy Procedia, V45, pages(362-371). Gerami, M. Lotfi, M. Nejat R. (2015). Inelastic behavior of cold-formed braced walls under monotonic and cyclic loading. International Journal of Advanced Structural Engineering (IJASE), V7, Pages(181-209). EsmaeiliNiari, S. Rafezy, B. Karim, A. (2015). Seismic behavior of steel sheathed cold-formed steel shear wall: Experimental investigation and numerical modelling. Thin-WalledStructures, V96, Pages(337–347). Paul, S. Radavelli, G. da Silva, Andrey R. (2015). Experimental evaluation of sound insulation of light steel frame façades that use horizontal inter-stud stiffeners and different lining materials. Building and Environment, V94, Pages(829-839). Ahmadi, M. Behzadian, K. Ardeshir,A. Kapelan, Z. (2015). COMPREHENSIVE RISK MANAGEMENT USING FUZZY FMEA AND MCDA TECHNIQUES IN HIGHWAY CONSTRUCTION PROJECTS. JOURNAL OF CIVIL ENGINEERING AND MANAGEMENT, Page(300-310). Jeynes, J. (2011). Risk Management: 10 Principles. New York: Routledge, Page(13-47). Rahman MM. Kumaraswamy MM. (2002). Risk management trends in the construction industry: moving towards joint risk management. Eng Construct Archit Manage, 9(2), Pages(131–51). Ferguson, M,R. (2012). Drywall Professional techniques for great results. 4th Edition. Taunton Press Inc. Pages(62-82). Canadian Sheet Steel Building Inistitute. (2002). Light Steel Framing Architectural Design Guide. Canadian Sheet Steel Building Inistitute. ISBN 1-895535-33-6. Ferguson, M,R. (2005). Drywall : Hanging and taping. 4th Edition. Taunton Press Inc. Page (73-102). Monghasemi, S. Nikoo, M, R. Khaksar Fasaee, M. A. Adamowski, J. (2015). A novel multi criteria decision making model for optimizing time–cost–quality trade-off problems in construction projects. Expert Systems with Applications, V42, Pages(3089-3104).